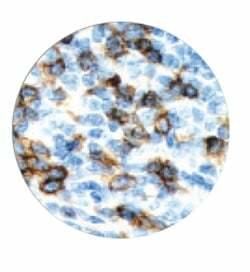 CD4 is a rabbit monoclonal antibody derived from cell culture supernatant that is concentrated, dialyzed, filter sterilized and diluted in buffer pH 7.5, containing BSA and sodium azide as a preservative. Small volumes of anti-CD4 antibody vial(s) may occasionally become entrapped in the seal of the product vial during shipment and storage. If necessary, briefly centrifuge the vial on a tabletop centrifuge to dislodge any liquid in the container`s cap. Certain products may require to ship with dry ice and additional dry ice fee may apply. CD4 is a glycoprotein expressed on the surface of T-helper cells, regulatory T-cells, monocytes, macrophages, and dendritic cells. On T-cells, CD4 is the co-receptor for the T-cell receptor (TCR). It amplifies the signal gener-ated by the TCR by recruiting the tyrosine kinase that is essential for activating many molecules involved in the signaling cascade of an activated T-cell. CD4 antigen is involved in the recognition of Type II Major Histocompatability Complex antigens (MHC-II). CD4 is also the receptor for Human Immunodeficiency Virus (HIV). It is present on most T-helper cells and normal thymocytes. NCBI/Uniprot data below describe general gene information for CD4. It may not necessarily be applicable to this product. CD4: Accessory protein for MHC class-II antigen/T-cell receptor interaction. May regulate T-cell activation. Induces the aggregation of lipid rafts. Associates with LCK. Binds to HIV-1 gp120 and to P4HB/PDI and upon HIV-1 binding to the cell membrane, is part of P4HB/PDI- CD4-CXCR4-gp120 complex. Interacts with HIV-1 Envelope polyprotein gp160 and protein Vpu. Interacts with Human Herpes virus 7 capsid proteins. Interacts with PTK2/FAK1; this interaction requires the presence of HIV-1 gp120.